caa.reviews is pleased to announce the publication of a new multimedia reviews project on the Scalar platform: Anne Teresa De Keersmaeker’s Work/Travail/Arbeid by Laura Weigert. 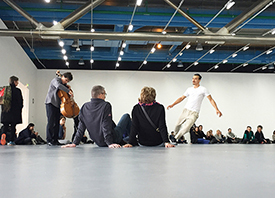 Weigert’s review of Work/Travail/Arbeid’s ten-day performance at the Centre Georges Pompidou in Paris from February 26 to March 6, 2016, is the starting point for this project, which also includes a conversation between De Keersmaeker and Weigert. The project features media explorations of the performances of Work/Travail/Arbeid at WIELS Contemporary Art Centre in Brussels and Tate Modern in London. The site will present additional media following Work/Travail/Arbeid performances at the Museum of Modern Art in New York from March 29 through April 2, 2017.